Hundreds of Little NHLers were feeling like big leaguers earlier this week when the Stanley Cup came to visit them. The Little NHL is an annual March Break tournament for young native hockey players in Ontario. This year it took place at the Iceland arena complex in Mississauga, and event sponsor Scotiabank brought a special guest along for the first day of the competition. “It’s pretty cool,” said Shawnee Bomberry, another Six Nations resident who was there to cheer on family members. Bomberry didn’t just touch it – she was even allowed to place her one-month-old daughter Charlie in the bowl of the hallowed silver chalice. Charlie yawned, blissfully unaware of the significance of the moment. 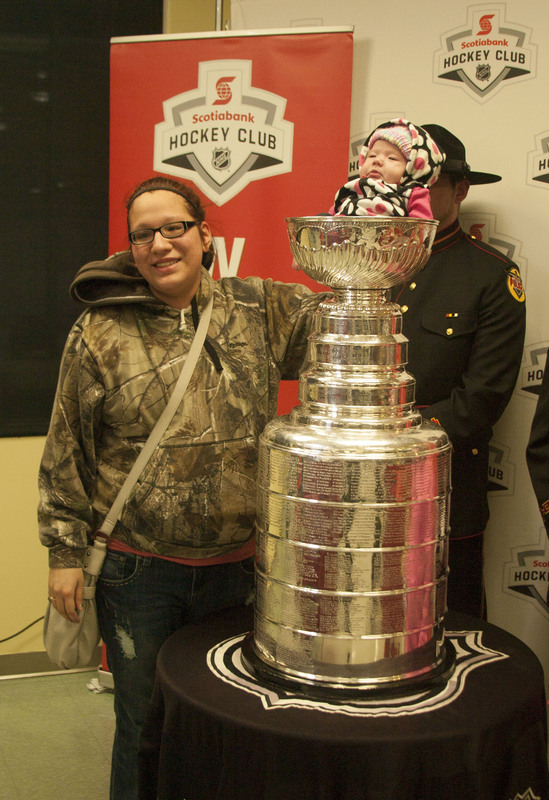 Shawnee Bomberry and her one-month-old daughter Charlie Elizabeth Ann Egan of Six Nations pose with the Stanley Cup during its visit to the Little NHL tournament in Mississauga. But everybody else knew what they were seeing. There was a huge lineup before the doors were opened to the public, and a steady stream of people continued all afternoon. They waited patiently to have a couple of precious moments with the Cup, posing for photographs to preserve the memories while two uniformed native police officers stood guard. “This is my second time,” said Crystal Jones, who’s from Garden River, near Sault Ste. Marie. She saw it for the first time last August when a fellow band member brought it home for a visit that included a community parade. Lee Walker is the national director of aboriginal financial services for event sponsor Scotiabank. She says the Cup’s visit was organized as part of the bank’s Bright Future Program, a philanthropic initiative that responds to community needs at the grassroots level. This year’s 42nd annual Little NHL tournament was the largest ever, attracting 154 teams from across Ontario. It’s reasonable to assume that most of the players on those teams have visions of not only seeing the Cup again someday, but of hoisting it and bringing it home – just like Jordan Nolan of Garden River. “You ask any of these little kids,” said Mike Bolt, a Keeper of the Cup who works for the Hockey Hall of Fame in Toronto. “The second you put on a pair of skates, you kind of start dreaming about this thing. This entry was posted in Hockey, Sports and tagged hockey, jonathon jackson, little nhl, mississauga, native, scotiabank, stanley cup on March 13, 2013 by jonathonjackson.